Child Custody Forms: Florida has an array of forms that deal with Florida child custody. You've asked us to simplify the choices available into easy to understand categories and explanations to what is available. This page is our attempt to simplify things for you. You'll find the most important Florida child custody forms, including the Modification of Custody or Visitation forms, child custody papers, child custody laws, temporary custody forms and instructions, and Florida's parenting plan forms as well. 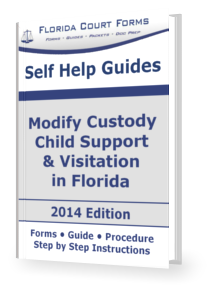 These Florida child custody and visitation forms should be used when you are asking the court to either change current court-ordered custody or visitation orders, or to have the court establish one. One important point to remember is that Florida now uses the term "time-sharing" to indicate custody and visitation. We use these terms interchangeably here because most of us (regular people) still call it custody and visitation. We will continue to use the terms custody and visitation until you and our customers decide to stop using them. Time-sharing is the term the courts now use to describe where and when the children spend time with their parents. In other words, child custody and visitation. Call us old school, that's OK with us. Time-sharing and parental responsibility are made part of an agreed upon parenting plan that is accepted by the court. The Florida child custody and visitation form Supplemental Petition to Modify Parental Responsibility, Visitation or Parenting Plan Time Sharing Schedule and Other Relief, Form 12-905(a) should be used when you are asking the court to change current court-ordered custody or visitation arrangements. A current child custody order may not be modified without a showing of a substantial, material, and unanticipated change in circumstances and a determination that the modification is in the best interests of the children. Modifying an existing Child Custody & Visitation order is generally done by using a Supplemental Petition to Modify Child Custody, Form 12.905(a). Also see our Self Help Guide below. When unmarried parents are involved, paternity must be established before child custody and visitation can be ordered and enforced. There are several ways that paternity can be legally established. The voluntary signing of the child's birth certificate at the hospital is the most common way for the legal establishment of paternity in Florida. Have a look at our Florida Petition to Determine Paternity & Other Relief web-powered instructions page. These instruction pages are very popular with Pro Se filers. They make it so much easier for you to prepare your forms on your own. Under Florida Statutes 751 an extended family member may petition the court for temporary custody of a minor child. This law allows a child’s grandparents, aunts and uncles, cousins, adult siblings, or step-parents (if the step-parent is still happily married to the parents) and other family members to petition the court for a temporary order granting custody. The definition of "extended family member" is a relative within the third degree by blood or marriage to the parent. The Florida state courts have published a set of forms for use by pro se parties to petition the courts to grant temporary custody of minors by extended family members. You can find these forms on the Florida State Courts website under the title Temporary Concurrent Custody. We have a more complete discussion of Florida's Temporary or Concurrent Custody law including information on how to file the Petition for Temporary and Concurrent Custody on our Temporary Child Custody page.